First Floor: 2x Bedrooms (All En-suite, Master Bedroom with walk in closet), pyjama lounge, balconies. 229m2 Double storey 2 bedroom house plan. 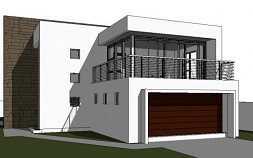 Innovative architectural functionality, features and a light-filled floor spaces are the hallmarks of this impressive modern style, double storey 2 bedroom house plan. The exterior of this 2 bedroom house plan is graced with stone cladding, contrasting colours of paint and expansive glass curtain walls with embedded casement opening windows. The design’s many features includes a patio, cantilevered canopy over balcony, stainless steel/wire balustrading and a cosy entrance porch with a canopy above. The double garage with an additional 4m2 of storage space accesses this 2 bedroom house plan through the main entrance hall and from there it leads into the lounge. A guest toilet is privately set off and passes through a built-in linen cupboard. The lounge area opens directly to the back swimming pool area through a wide sliding door that is nestled onto a glass curtain wall with ample of sunlight coming through make this a comfortable and relaxed area of the house. A straight flight of stair is well positioned on the side of the hallway that leads you to a well-appointed dining room that has an open plan connection with the kitchen. The staircase provides ample space for either an additional storage or a creative display back-drop. The dining room has dual exits, one to the patio and the other to a private garden area towards the back of this 2 bedroom house plan. The continuous theme of wide open glass curtain walls that characterizes this modern home, provides the ground floor areas with enough sunlight while generating a dramatic impact that unlocks nature’s outdoor beauties and openness. On the other side, the kitchen opens onto a compartmented scullery that further opens onto the backyard service terrace. Upstairs you are met by a delightful and airy hallway with its large open glass curtain wall. The two bedrooms are on separate wings for privacy. A unique master bedroom, loaded with ample space for an extra private couch boasts a cosy walk-in- closet and a tiled bathroom. The master bedroom enjoys direct access to a private balcony that overlooks the swimming pool area below. Another bedroom features a wall-to-wall built-in cupboard and self-contained bathroom. This bedroom also has access to compact balcony with views of the entertainment spaces below.